Tata Motors is one of the largest passenger car maker in the country and it has recently introduced another utility vehicle in its portfolio. It is christened as Tata Movus and is available with seven, eight and nine seating option for the buyers to choose from. The Tata Movus LX 7 Seater Captain is one of the top end variants that is available with seven seat option, wherein its second row comes fitted with captain seats. The main strategy of the company in launching this utility vehicle is to target the large Indian families, who like to travel together. Powering this trim is the slightly modified 2.2-litre, VARICOR diesel engine that is incorporated with a newly developed clutch for improving its life and durability. This engine can develop a maximum power of 118.35bhp in combination with a peak torque of 250Nm, which is quite good. The manufacturer has introduced this utility vehicle with decent exterior features including the body graphics on the sides, which makes it look contemporary. The space inside the cabin, especially the head and leg room is rather good, which can provide comfortable seating for all the seven passengers. It is available with a lot of utility aspects, but its safety features are quite basic, which should be improved. 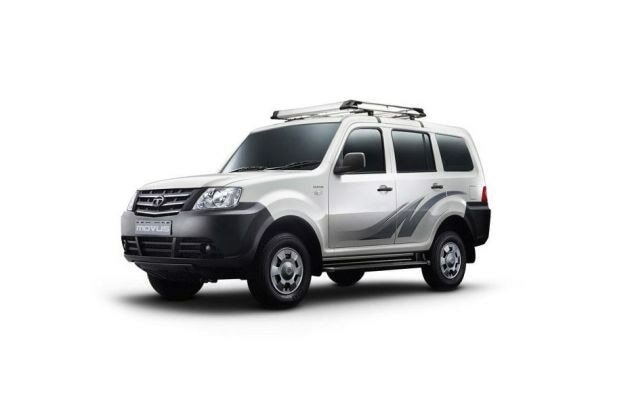 At present, the company is offering this utility vehicle in only two exterior paint options, which are Arctic Silver and Arctic White, which should also be increased for giving more options to the buyers. This newly introduced vehicle comes based on the Sumo Grande body platform, but its exterior cosmetics are slightly tweaked, which makes it look different. Its rear profile has a macho body structure that is equipped with a newly designed clear lens taillight cluster and black colored bumper along with variant and company badging. This bumper is further equipped with a pair of reflectors that provides additional safety to the rear. The tailgate is equipped with chrome plated company's insignia and model lettering, which adds to the elegance. The rear windscreen is quite large and has a black sash tape surround. Its side profile looks very large, but the stylish body graphics makes it look trendy. It has standard features like black colored door handles and external rear view mirrors that further compliments the elegant body decals. The company has fitted its pronounced wheel arches with a set of steel wheels that are further equipped with trendy wheel covers. Coming to the front, it is fitted with a black colored bumper that also features a wide air dam and a pair of air ducts as well. In the center, it sports a black radiator grille that has chrome inserts and a company's insignia on it. Surrounding this is the aggressively structured headlight cluster incorporated with halogen headlamps, which further adds ruggedness to the front profile. This newly introduced Tata Movus LX 7 Seater Captain trim has a large and a neatly done up cabin with ebony black color scheme. The dashboard in the cockpit is borrowed from Sumo Grande, but its central console gets a lot of silver inserts, which gives an elegant look to the cabin. Both the first and second rows have been fitted with two individual seats, while the third row is equipped with a bench seat, which are covered with fabric and vinyl combination based seat covers. The door trims have been done up excellently with fabric inserts, while its internal door handles come with a black and silver based dual color mix. The car maker has equipped a number of utility aspects inside like alternator interior fan, mobile holders, roof lamps, bottle holders and several other such aspects for the convenience of the passengers. The luggage space is quite less inside, but it can be further increased by folding the rear seat. This utility vehicle has a large fuel tank that has a storage capacity of 65 litres , which is quite good. The company has equipped this trim with a modified 2.2-litre, VARICOR diesel engine that displaces 2179cc . This engine is now integrated with a concentric sleeve cylinder and a self actuating clutch, which improves the performance, while minimizing the usage of clutch at the same time. It has four cylinders that are integrated with 16 valves and is based on the DOHC (dual overhead cam shaft) valve configuration. This diesel motor is capable of churning out 118.35bhp at 4000rpm in combination with a peak torque yield of 250Nm in the range of 1500 to 3000rpm. Its common rail fuel injection system helps it to produce a maximum mileage of approximately 16 Kmpl, which is rather good. Its torque output is distributed to the front wheels via a five speed manual gearbox, which is smooth and proficient. The front axle of this utility vehicle is fitted with an independent double wishbone mechanism , which is further accompanied by coil springs. At the same time, its rear axle is equipped with a parabolic leaf spring system. In a bid to enhance the suspension mechanism, the company has also incorporated anti-roll bars, which further augments the suspension. The company has fitted a pair of disc brakes to the front wheels, which along with a single pot caliper, whereas the rear ones have been fitted with drum brakes that delivers a reliable performance at all times. This Tata Movus LX 7 Seater Captain trim comes with a list of practical features including a power steering with tilt adjuster, a HVAC (heating, ventilation and air conditioning) unit, tip-tap external rear view mirrors, illumination key ignition slot, front roof lamp, a digital tripmeter, sun visor with passenger side vanity mirror , a mobile holder in the central console, side foot step for easy ingress and egress from the vehicle, a cable operated remote fuel lid and several other such utility based features. The company has given this utility vehicle some of the most significant protective aspects. The list includes motorized head lamps adjustment, child lock for rear doors for enhanced safety , a driver door ajar warning light, a high mount third brake light above the tail gate, anti glare internal rear view mirror, height adjustable seat belts for all the passengers and a few other such aspects for the protection of the occupants as well as the vehicle. 1. Very spacious and ideal for large families. 2. Engine performance is quite reliable. 1. Boot compartment is very small. 2. Ground clearance is lesser when compared to its competitors. Tata Movus is available in 2 different colours - Arctic White, Arctic Silver.